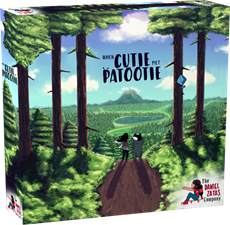 Travel along Alaskan shores and discover truth about Cutie's parents' whereabouts in When Cutie Met Patootie, a new area movement/pattern building game by The Daniel Zayas Company. In When Cutie Met Patootie, players then take turns playing a path card each turn. These cards are used for building the map, helping visitors collect sprite gems and spend those gems to advance visitors along the built map. Players connect paths to create a pyramid shape, ever tightening the forest path! The end of the game is triggered when one visitor reaches the top. Players reveal their secret roles, each detailing specific sprite gems for which they earn points. The person with the most sprite gem points wins! Support the game's physical release through Kickstarter!